Half of 2012 is almost over. It’s been such an interesting and challenging year so far. Even though the new office is light and bright, I’m really missing the hustle and bustle of the city. I used to dislike going into the city during the weekend because it felt too close to work. 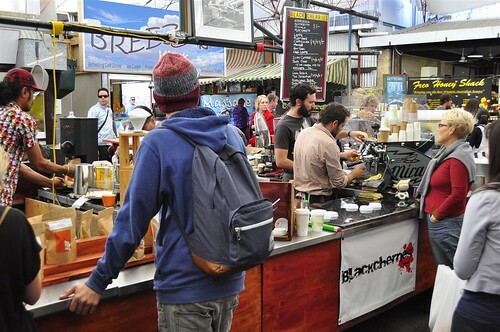 But lately, I’ve been thinking about city coffee, the familiar buildings and my favourite shops. I also miss meeting Jo in the city center after work for Friday evening shopping. But we’ve been making up for it by shopping during the weekends. Except somehow we never end up buying anything for ourselves. Because we’re too busy shopping for our baby niece Kaka and the upcoming Jo/HC baby too! Baby clothes are really cute and irresistable and so are children storybooks and toys. I’ve also put up cute pictures of Kaka at my workstation and all my workmates think that she’s my daughter hehe, I wouldn’t mind a cute daughter like Kaka (^___^). Life is changing for my family, actually it’s already changed with the arrival of Kaka and I know it will be even better and brighter with the arrival of Jo and HC’s baby in December. I’m really loving being an aunty Daitaoha and am looking forward to the rest of 2012 and beyond. 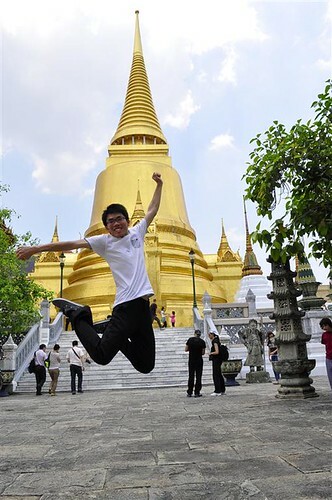 This is my final Bangkok post!! Bangkok feels so long ago and already the heels of Bangkok shoes are scuffed and worn. I need new shoes but more importantly, I need more holidays (^___^)Y. Our last walk around Pratunam in the morning. I knew I would miss the street vendors selling knick knacks and the most amazing variety of street food. 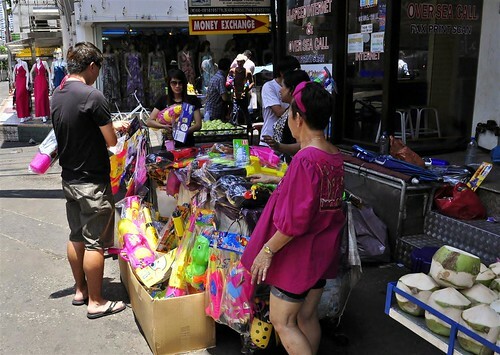 Stall selling water guns and other water weapons. 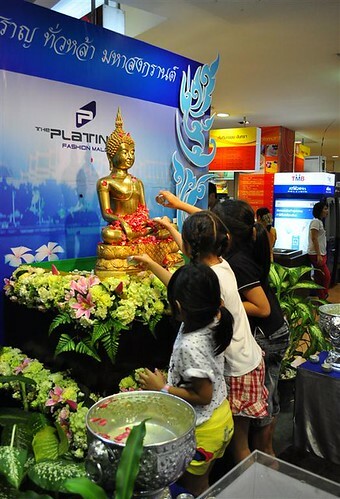 It was the start of the Songkran festival and in that regard, I was glad it was our last day in Bangkok. Still, we didn’t manage to avoid the locals and their water festivities during our last hours, I recall being chased by locals brandishing their water guns and of a greater magnitude, buckets laden with water. At one point R had to negotiate his way out of the bucket instead convincing the local to let him off with a water gun. It sounds scarier than it was, actually it was all in good fun, a little troublesome since we were hoping to get to the airport dry, but a half wet outfit wasn’t too bad and the locals did let us off easy with cheeky grins and smiles. Inside the safety of our hotel lobby, we stood by the windows and laughed at others getting completely drenched by water hoses and giant buckets. Even the hotel staff were soaked from head to toe as they helped us with our luggage, but everyone was very sporting and partook in the water activities with gusto. Remember the Songkran festival poster that I featured in my last Bangkok post? We thought it was a poster advertising a concert but we completely missed the mark and it was actually a foam and water party! 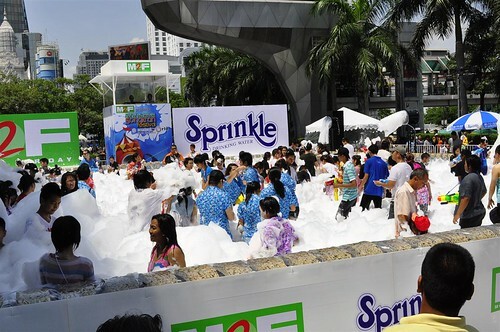 This was held at the Central World arena, the once pristine and clean grounds were covered with foam and bubbles and very wet water gun totting people. 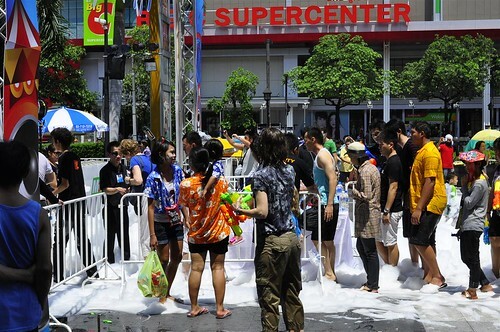 If only it wasn’t our last day in Bangkok, I reckon I would have bought a giant water gun and jumped into the water festivities too. The festive atmosphere was really something to behold. 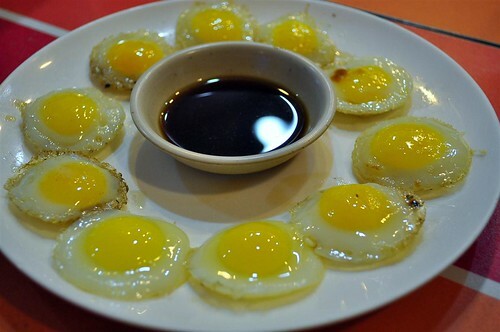 I spotted this sinful snack of fried quail eggs during the early Bangkok days but somehow kept missing out on them. So I was really happy that they were selling this during my last day and bought a whole serving. This is not for the faint hearted but it was very yummy. A friend (you know who you are) commented that all my Bangkok posts seem to feature chicken rice, ‘is that all you ate throughout the whole trip?’ I was queried. 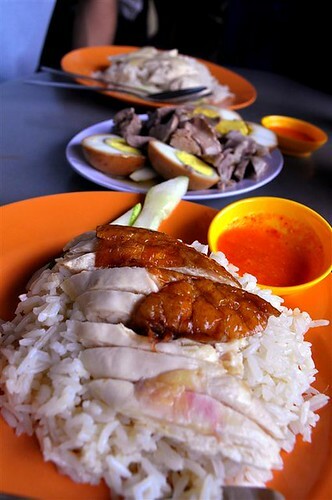 *Hangs foodie head in shame* I did eat a lot of chicken rice in Bangkok, and even had chicken rice during my stopover in Singapore, I can’t help it, I love chicken rice! 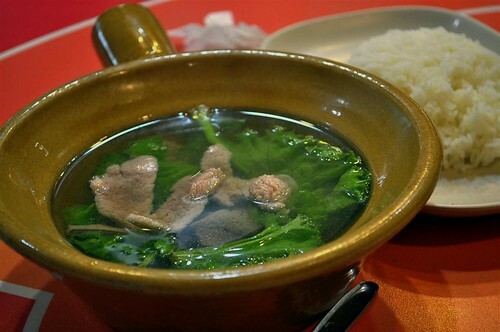 I can’t remember what this was, obviously some porky soup dish with rice. We didn’t have anything that was less than yummy Bangkok so I’m pretty sure this was good too. 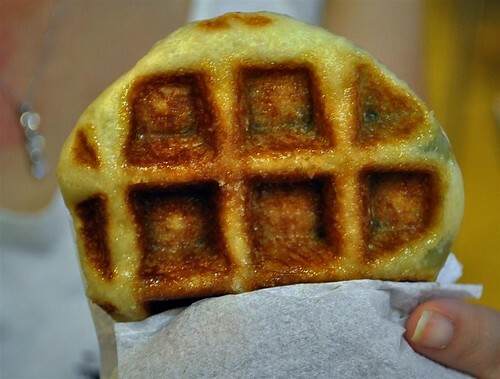 Another popular Bangkok snack, the humble waffle. Their waffles have many different fillings in them but this one was just the original waffle, very tasty it was too, chewy with this slight crispy caramelised texture on the outside. Time to say goodbye to Bangkok! This sculpture was smack bang in the middle of the transit hall. 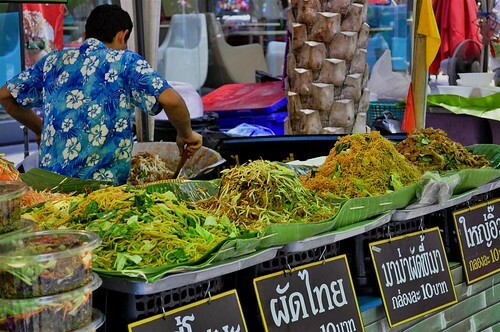 I really enjoyed our trip to Bangkok, the food was amazing, the BTS system was impressive and efficent, the shopping was great, there’s so much to love about Bangkok and I would love to return again. 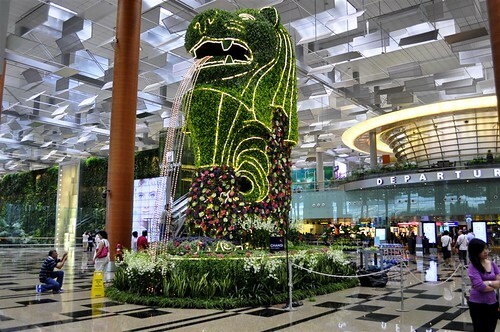 A few hours later and we were in Singapore, or Geylang to be exact. 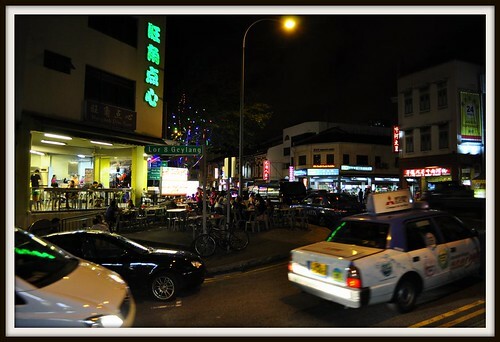 This red light district of Singapore is also well known as a late night foodie joint. We passed by many coffee shops boasting popular Geylang fare including frog leg congee, stir fried fallopian tubes and 24 hour dimsum. 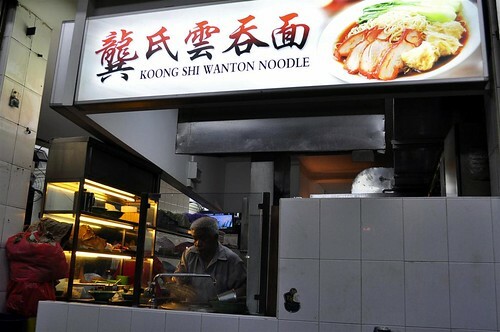 But somehow they didn’t seem appetising and we ended up having wanton noodles for supper instead! 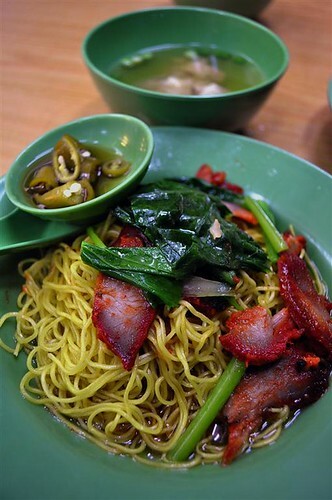 Our wanton noodle stall was popular and it was a little wait before our noodles arrived but they were worth it, a simple and perfect midnight supper. What’s for breakfast? 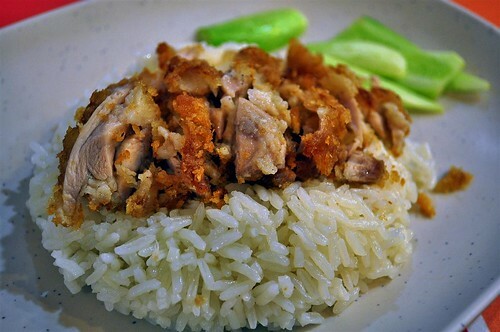 Chicken rice of course!! (= ^ ^ =). I’ve had much better chicken rice in other parts of Singapore (and Bangkok haha) but hey, can’t stop by Singapore without eating chicken rice. Changi airport’s Terminal 3 has all these new shops (or maybe it’s been a long time since I’ve been there) including this shop that sold lots of cute Miffys. 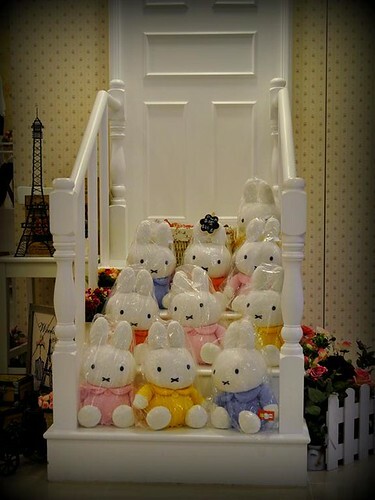 I wish I could have bought all of them for my baby niece (and maybe keep one for myself hehe). Last look at Merlion and we were back to Perth. Sigh, I wonder when I’ll be able to blog about another holiday again…. We have to wait till October for the next long weekend (T________T). 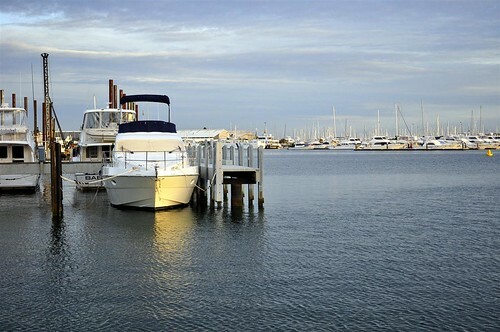 I really do think that the WA government should spread out the public holidays a bit better throughout the year, a grey, gloomy and extra wet winter is bad enough without having any public holidays to look forward too. SIGH. Anyway, here are some pictures from the WA Day long weekend which also happened to be R’s birthday, such good timing. 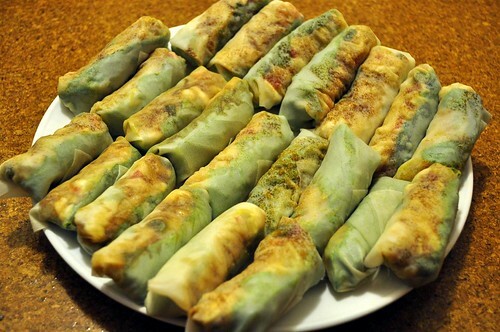 I did quite a bit of cooking over the weekend, these were my mini vegetarian pohpiahs. 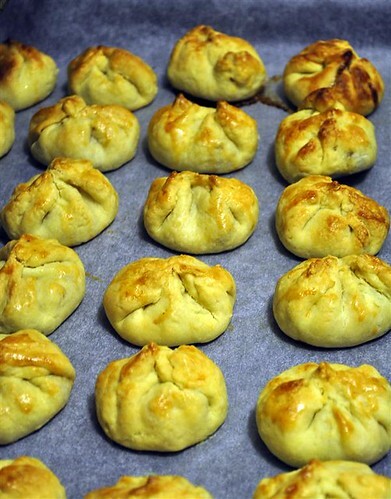 Sio baos for my farewell morning tea at work. My colleagues liked them but the pregnant Jo loved them. I even had to ‘dapao’ some from my morning tea to take home for her even though I had packed her half a dozen a few days earlier. This is called the Lion’s Kill. Can you guess why? 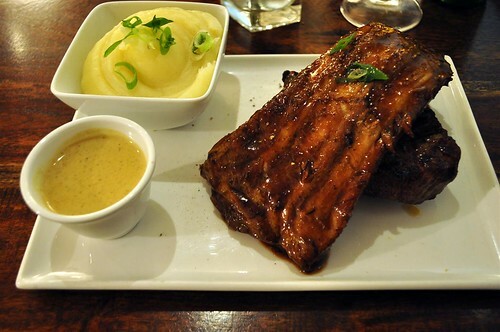 Under the slab of bbq ribs was 350 gm of Black Angus sirloin steak. The restaurant was loud and festive, not a romantic place for two but great for a crowd of friends. The food was pretty good too. 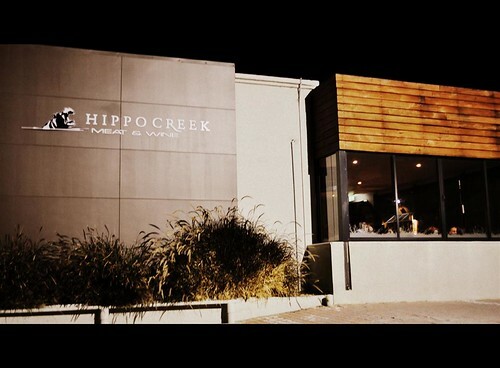 Long weekends aren’t complete without Freo outings. I don’t think we predicted that we would be heading back so soon when Shirley and her friends came to town! 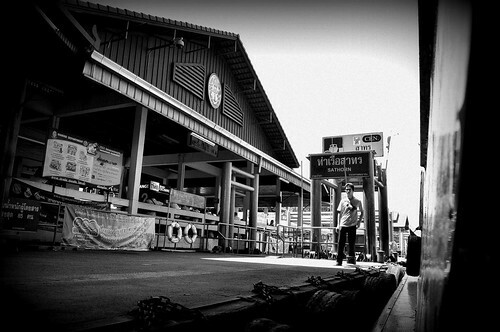 For HC, a long weekend means fishing solitude by the Sardine jetty. Well, not really solitude since we were all there being pests and generally doing everything but fishing. 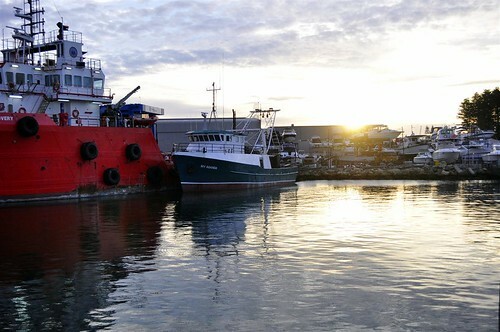 It was a beautiful day, a complete contrast from the crappy weather that we’ve been facing for the past couple of weeks. 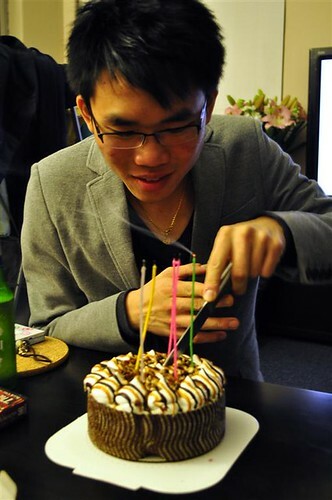 Can’t end a birthday post without a picture of the birthday boy with his birthday cake. It was a good birthday and a nice long weekend. I am starting a new job in a new office tomorrow. Technically it will be my old workplace but in a completely new role. And I am super happy about it. The only downside? Saying goodbye to fantastic coffee in the cbd, but let’s see what East Perth has to offer. My very first housemate in Perth and close friend Shirley is in town for the weekend. So yes, life is pretty good. Day 9 was our last full day in Bangkok. 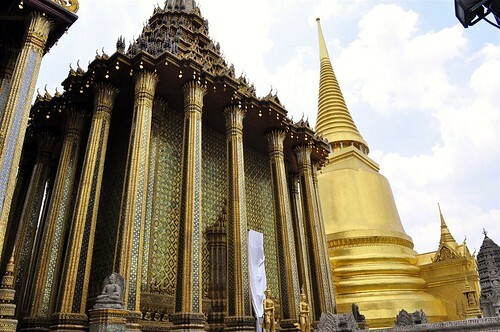 I remember it being very hot and all about the Grand Palace. 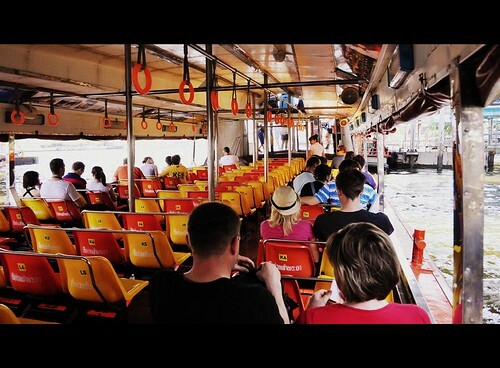 Back on the Chao Phraya river enjoying the sights and the river breeze. 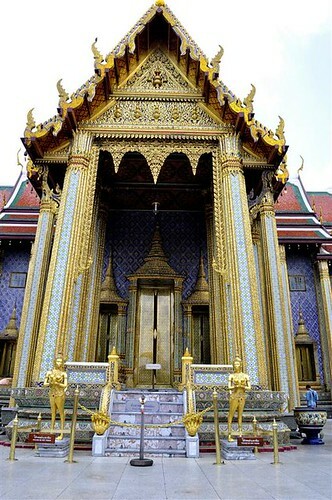 This was our second attempt at visiting the Grand Palace. Remember to get off at the Maharaj Pier. 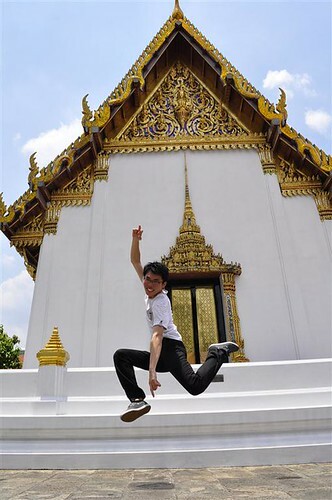 Beware of scammers who pretend to be ‘tourist police’ and tell you that the Palace is closed for the day or only open on certain hours for Thai locals. They will steer you towards tut-tuts who will ‘bring’ you to other temples/jewellery factory nearby for a fee. If in doubt, head towards the official tourist information booth for information. 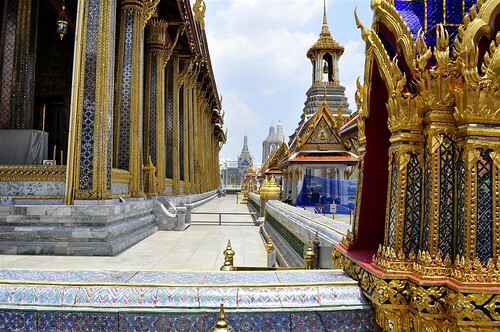 A strict dress code applies to enter the Grand Palace. Men must wear long pants and shirts with sleeves (no ribbed jeans and sleeveless Ts here). No flip flops or sandals are allowed. Women must be modestly dressed, no low cut or bare midriffs, to be safe, just wear a T-shirt (not sleeveless) and long skirt or pants. For those that aren’t dressed correctly, you can ‘borrow’ clothes at the entrance (a deposit IS required) but the wait is long so it’s best to just come dressed properly. Btw, there are also signs prohibiting cameras but that was mostly ignored by all tourists. Outside the Palace you can hire a guide (they speak many languages) for a price which is negotiable. I think we were quoted a 500 baht price but preferred to wander around on our own. In hindsight, it was probably a good idea to get a guide to learn more about the history and folklore of the Grand Palace. 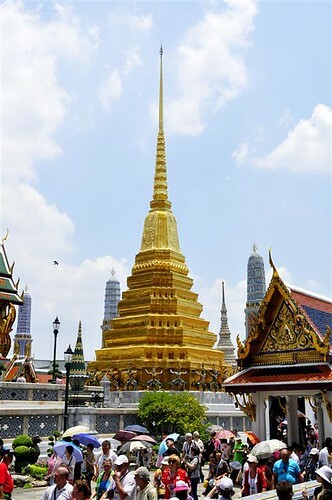 The Grand Palace is made up of many buildings including temples, great halls and courtyards. It’s majestic and surprisingly cooling inside the shaded halls. 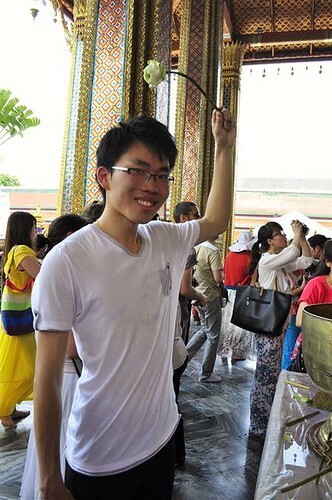 R outside the Temple of the Emerald Buddha dripping some blessed water on himself. Don’t know whether we got luckier after that. Thai architecture is pretty amazing and itricate. 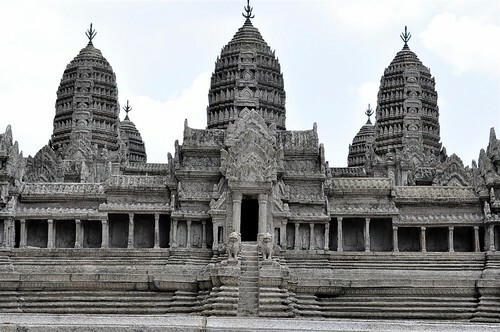 This was actually a carved up stone miniature of the temples. It looks quiet but there were actually masses of tourists everywhere. It could be that everyone was hiding in the shaded courtyards though because it was so freaking sunny and hot that day. 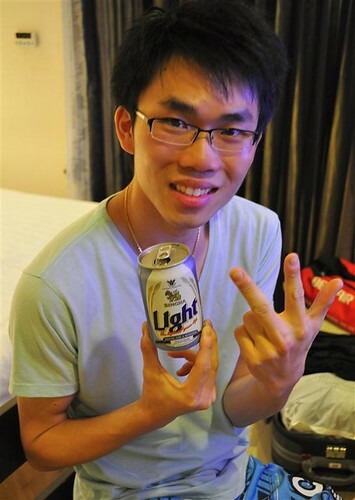 I have to confess, I coerced the Leaping Lord into taking this photo. And this one too (=^____^=). Oh how high he jumps. 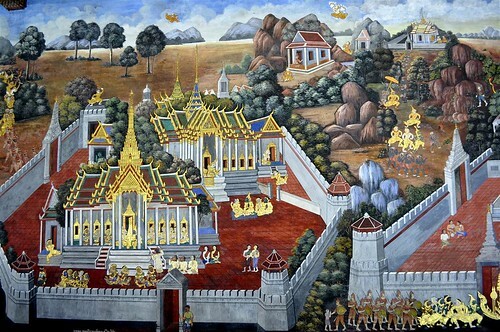 A painting depicting the myth of the demon warriors and how they end up guarding the gates of the Grand Palace. 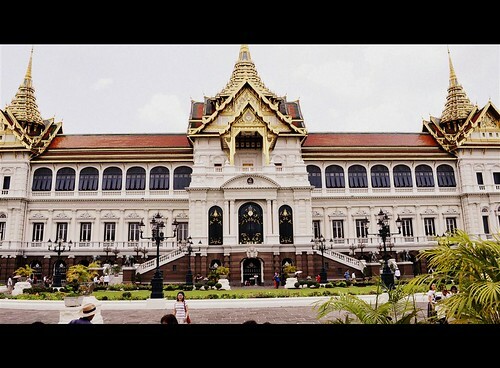 The Phra Thinang Chakri Maha Prasat which is the throne hall used by the King during important state occasions. The Leaping Lord strikes again! 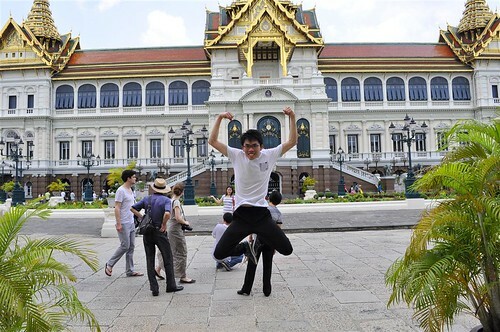 Haha, that was our last picture at the Grand Palace, our most touristy destination yet and possibly the best. 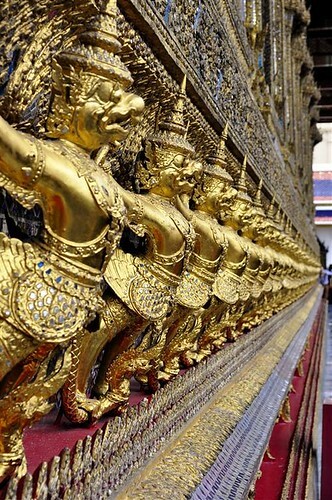 I really enjoyed the sights and buildings of the Grand Palace, it’s most definitely worth a visit and possibly the best tourist attraction in Bangkok. Back to the hotel for a much needed shower and then maybe a icy dessert or two? 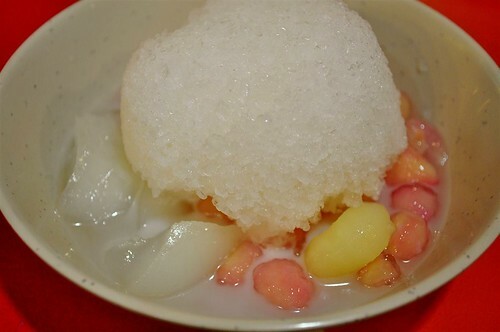 This coconut milk water chestnut icy dessert was lovely. 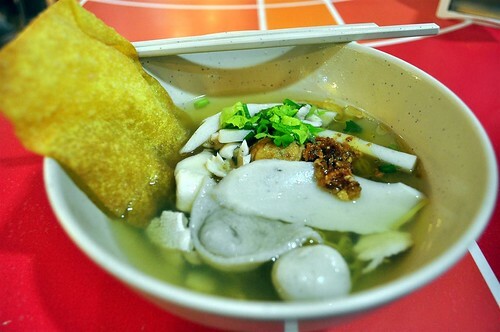 Fishball noodle soup for lunch, as usual, this Thai dish was flavourful and tasty. For the past two days we had been noticing lots of stage building activities around the shopping area. All the locals were also getting excited and scarily, the shops were starting to sport a lot of water guns and other water paraphernalia. 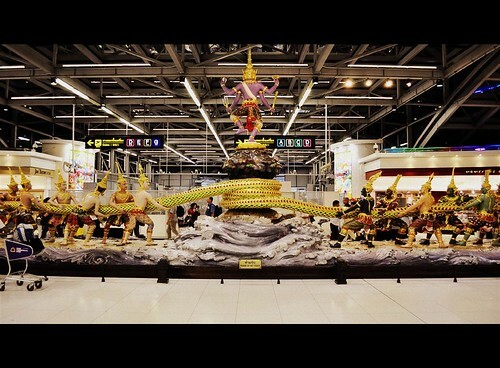 Songkran was arriving. Locals were ‘bathing’ buddha images a lot and shrines were filled with flower wreaths and rose petal water. Elephant statues surrounded shrines and on Day 9, the elephants were covered with flower wreaths. Touts sold roses by the roadside and soon the shrines were lined with rose stalks. 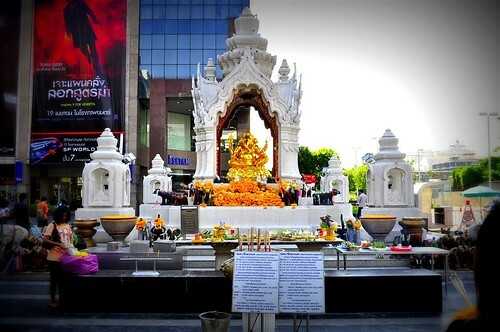 I know the local Thais were looking forward to the Songkran festival partly because it would be great to beat the heat with water festivities. 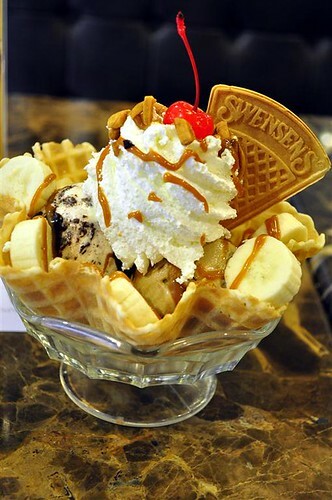 For us non locals, we could only cool down with more Swensens sundaes. 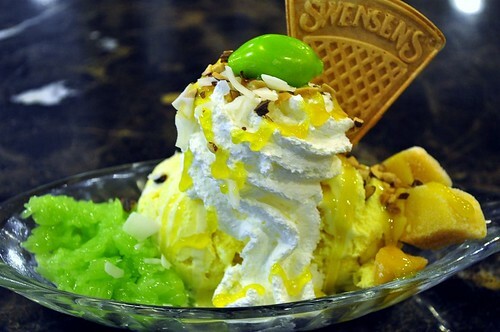 Luckily Swensens outlets are readily available everywhere and their local mango themed sundaes were so yummy. Sigh, I miss this. 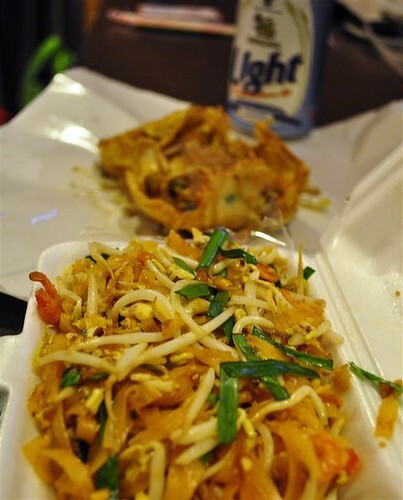 Day 9 supper of roadside stall Pad Thai and more oyster omelette, perhaps the ultimate Thai combination?